(I was originally writing this over the course of a week to post on 1/1, but I decided there was enough meat that would drown out a year-end recap). What I forgot about was that the entire week before the major work event can be a disaster because it wasn’t last year. As early as December 11, I knew there was an issue and I subsequently hit goal only two days that week. Uh oh. 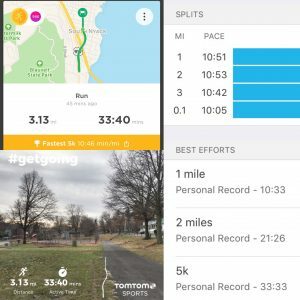 Part of me thought I’d be OK since my 2K days don’t tend to stay 2K days since I started running but Saturday 12/23 was rainy, cold and miserable, and Christmas Day was too busy. There were some good things over the Christmas long weekend. 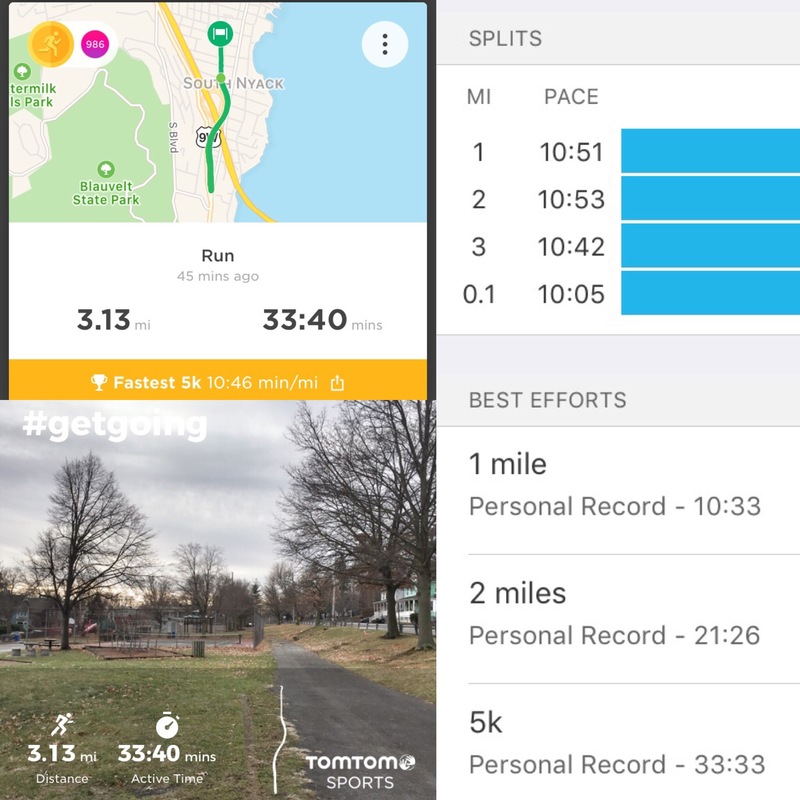 My Christmas Eve run was a present from the Ghost of Running Present, a PR on the South Nyack Trail. 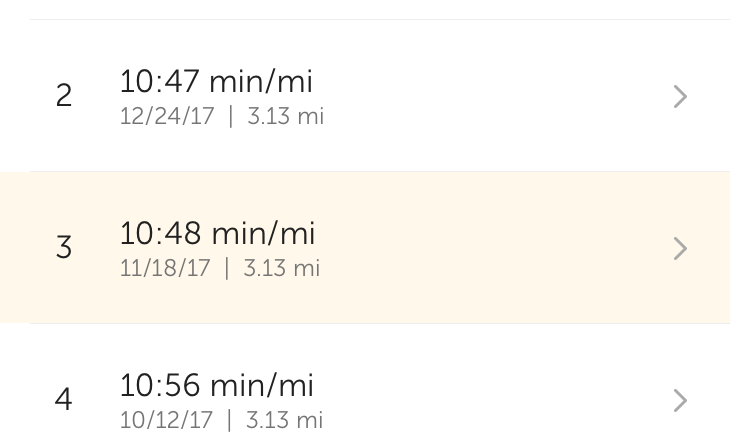 The PR itself was 1m9 seconds over the same trail three months prior (and yes, I finally just ran the first lap twice!) and an eight second PR over November 18. 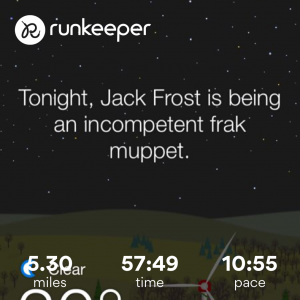 I love that RunKeeper makes it so easy to ID and find the similar runs. That progress makes me think it is possible that I’ll break 30m for a 5K by December 31, 2018. Even ignoring the really early ones, I’ve taken nearly 5m off my 5K time since June. Baby steps. 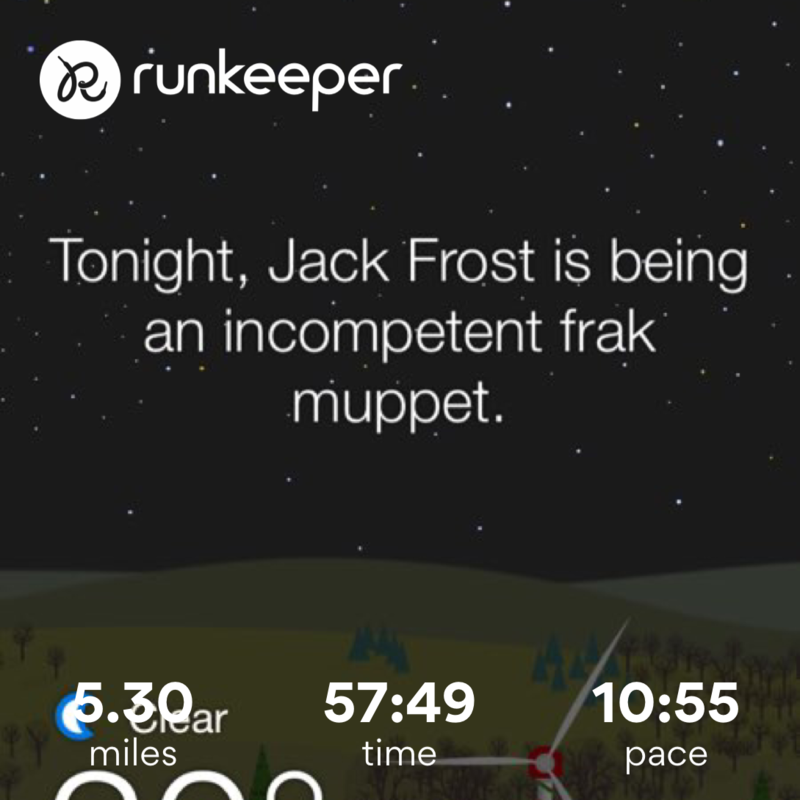 It was also a Festivus miracle in that it was relatively accurate across TomTom, Strava and RunKeeper! 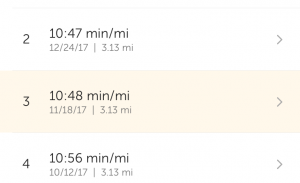 Speaking of Strava nonsense, I love that #7 on the NYRR/Strava virtual race tips is to run extra because Strava is a muppet when it comes to rounding. (I might do their virtual ones, still thinking about it). My first day back to reality and my routine was a good treadmill run. I didn’t have a planned distance since my training is off and I don’t want to overdo it and risk injury, but I was thinking about an hour. Yep. Lungs wise I could have gone longer but my legs were starting to hurt and I was understretched having been away and hadn’t run longer in a while, so I smartly cut it there. Legs felt good after a good stretch and foam roll. Can I pull out 400K? It’s still a definite maybe, but I’ll give it my best. I recently read Mile by Mile’s post on the magic of the long run and it’s so true. Although I love Mile High Run Club and don’t really mind running 5-6 miles on the treadmill at the gym, there’s no magic the way there is in an outdoor long run. I think part of why I’m struggling in December is I haven’t got outdoors nearly enough. Combo of being sick early in the month, getting dark early and the weather. It’s not going to happen this weekend either, but hopefully before my January run. In the mean time, some treadmill tips. I really wish I could read. I have been getting in my Iron Chef fix though when there isn’t football on. I love the idea of Mind, Body and Spirit goals. I need to think about spirit, but I think I have mind and body covered. Not having the scale as part of my body goals, is partly a mind one as it’s just frustrating and nowhere near as measurable as running progress goals. Fuel-school. I have stuck with gels when I’ve used them, but I found this guide to the various fuels super helpful. One day I’ll even remember to use them consistently. I think part of the struggles in my learning week was running on empty. I can do it, but probably not smart when I’m also mentally exhausted. This time of year is tough! I definitely struggled early in December, then felt good for a couple of weeks, and now Im sick. Im trying not to worry too much about it because there’s not a whole lot I can do. Good luck with your goals over the last few days of the year! I got stymied in my running over Christmas by the ICE and had to go to the gym and cycle nowhere (reading). But I still beat Liz Last Year, and this I am glad of. CYcling to nowhere was me today. Dire need of off day but needed some activity and too cold (5F, wind chill -6) to walk anywhere outdoors safely.